Anglesea coal mine extension – Ted Baillieu’s worst environmental decision yet? Baillieu’s worst environmental decision yet? Today’s announcement that coal mining will be allowed to continue at Anglesea is possibly the worst in a long list of bad environmental decisions since the Baillieu government was elected, according to Friends of the Earth. The government says that the supporting legislation, introduced to parliament today, will “modernise” its agreement with the Anglesea coal mine and power station and support regional jobs. Alcoa began operating the mine in 1961 and indicated in 2008 that it would exercise its right to extend its lease another 50 years. Any future mine expansion will now be limited to three per cent of its total lease area, which is 7,145 hectares, and be subject to a new environmental process. “While the government can say that Alcoa had the right to extend its agreement, the fact remains that the coal resource is the property of the state, not the corporation,” Mr Walker said. “The Energy and Resources Minister, Mr O’Brien, says that the revised agreement is a ‘win-win’ outcome. But who wins? Alcoa, who gets to continue to burn dirty, high sulphur coal. “Who loses? The community of Anglesea, who will have to bear decades of public health impacts. The environment loses, as climate pollution will continue. The highly significant coastal heath lands will continue to be negatively impacted. “The time for further investment in dirty coal is over. The Baillieu government has yet again missed a significant opportunity to begin the transition to sustainable energy. “A giant corporation has won out against the long term interests of the local community. This is the same pattern we see at Bacchus Marsh and elsewhere, where landowners have no control over proposals for new coal and CSG operations. Click here for more information and how to take action. 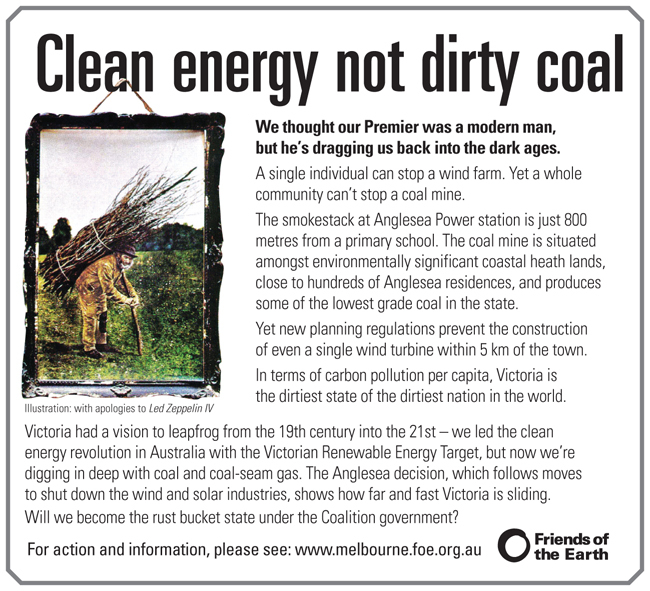 Check here for a response from local group Anglesea Air Action. MPs, calling on them to work together to find renewable energy sources to keep the Point Henry smelter going without having to rely on burning coal at Anglesea. This post really doesn’t do enough to contextualise this news; I struggled to understand it. What does Cam Walker’s quote refer to and mean? [from Cam. Could you explain which quote you would like more details on please? I know of a few communities who stopped windfarms, and im sure they could stop a coal mine to if one was to try to spring up under them. In defence of the coal mine at Anglesea it has been there for a lot longer than most of the parasitic ex melbourne population that now inhabits the town, but that said it is not in a good location and should not be expanded. The power of the tide should be harnessed, its much more reliable than the wind, although you can always rely on a onshore wind to blow up in summer when you want to go for a surf, but it soon stops once the sun goes down and takes a while to fire up in the morning. well thats charming, Peter, calling Anglesea people parasites. Most of regional Vic has growing numbers of people from Melbourne. Are all those people parasites too? I trust you have lived in your area for 18 generations so as to avoid this label? And just because something happened in the past doesn’t make it right now. We learn, and adapt to the realities of the time. Its not 1961 any more. If we used your line of thinking, that something happened in the past so we should keep doing it, we would still hve slavery, women wouldn’t have the vote, etc, etc. Bad argument if ever I heard one. Peter, you couldn’t be more wrong about wind turbines stopping once the sun goes down during summer. At the nearby Toora windfarm, the onshore breeze coming from Corner Inlet keeps the turbines turning until well into the early morning most days. One thing this region is known for is its regular winds which only vary according to season. Easterlies over summer, take your pick for the rest of the year (but mainly westerlies). It’s probably only late autumn when the wind farm doesn’t operate as frequently. By the way, how exactly are people retiring from Melbourne parasites? Are you suggesting they don’t pay rates, buy from local businesses etc. 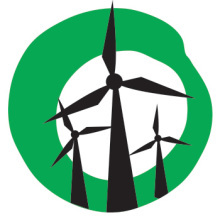 There is an argument that people opposing windfarms could be acting parasitically on generations to come. People from melbourne have been pushing to much development in coastal towns for the last 20 years. its one of the reasons why enviromental degredation has been taking place at such a rapid rate. many people in small towns in these areas can no longer afford for their families to live close by due to the inflated property costs, thus the resentment from long term locals. The same has been taking place in many other rural areas, daylesford is a great example. Its not really a argument one way or the other from my point of view, Its just a fact, and whether or not the coal generator should be expanded is largly driven by extra demand from many of these people amongst others. The funny thing is friends of the earth are complaining more about this than the locals are! I went to a meeting of Anglesea residents with about 250 people in attendance. That’s over 10% of the town which is a pretty good showing I reckon for a Sunday arvo meeting. The residents are definitely not happy. Also, this particular generator is run by Alcoa to power the Point Henry smelter. It’s not just for supplying local residential need. The power station is not ‘for’ anything other than generating electricity. The power station is connected to the national electricity network. If the station went offline it would have no impact on the town or the operations of the smelter, except that the smelter would have to pay the same for electricity as you and me, which Alcoa will say it can’t afford.